School is the same as anything else. You do it because you're told to do it when you're young enough to listen. You continue because someone told you it was important. It's like you're a train in a tunnel. Graduation is the light at the end. Ellie's mother didn't believe in cleaning. My mother was dead, and I had no idea if she was ever a clean freak or what. But Ellie was... Ellie. Ever since we were little, she'd change the rules of a game halfway through. You didn't tell your biggest secrets to someone like that, right? But I didn't tell Ellie that either because she thought she was my best friend. Regardless, having a dead mother isn't convenient, especially when she died because she stuck her head in an oven and turned on the gas. Although, I'd argue that there is some convenience in having a death machine right there in your kitchen waiting for the moment you finally get the nerve to do it. I'd argue that's more convenient than a fast-food drive thru. You don't even have to leave your house to stick your head in the oven. You don't even have to change out of your bathrobe. You don't even have to take your kid to preschool where it was Letter N Day and she was ready to show off her acorn collection. You don't have to remember to do anything but breathe in and breathe out. That's about as convenient as it gets. What's inconvenient is: Living in a world where no one wants to talk to you about your dead mother it makes them uncomfortable. Glory O'Brien's History of the Future is dark, surreal and poignant. Written in a fluid and compelling style, it's really quite a literary masterpiece that further solidifies my love and admiration for A.S. King and her prose. To me, this book is perfect. 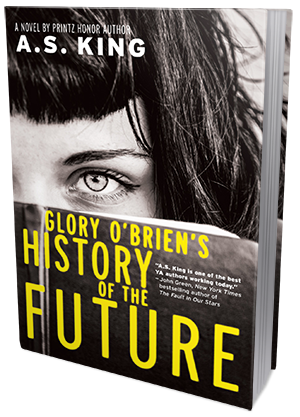 Bottom line is: Glory O'Brien's History of the Future is a rare treat among YA literature, and one absolutely not to be missed. It's a smart, sharp, deftly written tale and it's filled with existential themes, dark humor, emotional resonance and artistry. You really don't want to skip this one.